This tip is for those of us who like to stretch and squeeze out every last drop of anything to make it go further. I am one of those people. You know those times when you only need to wash one spoon, or one bowl? Around our home, this usually happens when the dishwasher is not yet full enough to run, but all of the bowls were used last meal (we have a big family), and someone needs a clean one for a cereal snack. 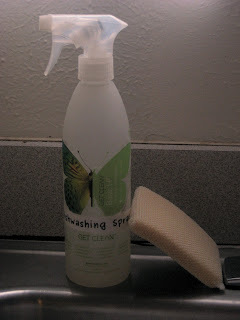 It is almost impossible to pour out only one drop of liquid dish soap to wash that one item. Usually you end up squirting out way more than you need, maybe even enough to wash a whole sink load of dishes. So I have found a perfect solution. Here goes: are you ready? To make it, pour 1/8th -1/4th cup of liquid dish soap (depending on how thick your soap is) into a 16 oz. spray bottle. Fill it up the rest of the way with water and shake to blend. When you spray it on your dish, the dilution saves the step of adding water, and you use only the amount you need. Just wash with a sponge, and rinse in hot water. Wow! I am totally going to try that at my house! Did you say that you used Shaklee cleaners? That is a great idea. I am always having to use so much soap to wash like one bottle. I will definitely try it :) I hope you continue to post more of your great ideas. Thanks, Rebecca...I will:) Let me know how it works for you. Thanks, Alyson ~ I think I have seen one of those. Right now, I have those sudsing dispensers in our bathrooms, but they seem to break every once in awhile, so I will keep this one in mind.